Goat farmers in Ndu, a local market in north western Cameroon have been enjoying a major boom in business as the demand for their wares is not only growing, but the local selling price has almost doubled. 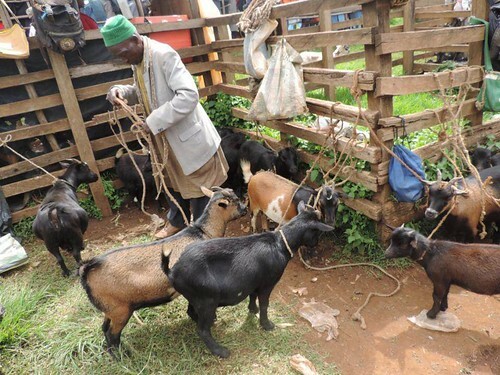 “The demand has grown to a point that all our goats are sold by 10am each market day” says Stephen Ngala, president of the Goat and Pig Traders Union of Ndu which has a membership of more than 200 goat keepers and traders. Indigenous goats in Cameroon serve as a secure form of investment, a means of income, source of manure and for various religious and ceremonial functions. They are easy to acquire and maintain and often provide the only practical means of utilizing vast areas of natural grasslands in the areas where crop production is uneconomical. However, the farmers in Ndu who also supply major cities in Cameroon and neighbouring Gabon are unable to maximize on the economic potential of goat keeping, their main challenges being mortalities and reduced production due to diseases. Through an innovation platform system (IP), a Swedish funded project on Harnessing genetic diversity for improved goat productivity has begun addressing the issue of low productivity by training farmers on best practices in goat keeping.The project which is led by the BecA-ILRI Hub is part of a bigger BecA-Sweden partnership on food security and climate change mitigation. Napoleon Nfor, an agro-veterinarian and a member of the project’s IP, pointed out that most of the losses of animals to disease were due to weak offspring from inbreeding. “The high rate of inbreeding within herds in this community is causing farmers to lose up to 60% of their animals to disease,” says Nfor. “The farmers can avoid such losses by buying new males for breeding,” he said. During an open day held by the IP in June 2014, farmers in Ndu were given practical advice on management of breeding within their flocks like learning to distinguish animals from the same family; and keeping records of identification, origin and purchases. The participants of the training also received tips on proper feeding of their animals to improve the productivity and growth rates of their animals; and management of flocks by confining them to pens to prevent them from destroying crops. The advice was well received by farmers including Emmanuel Ndzi who vowed to follow the best practices he had learned. “I did not realize that I was under nourishing my goats by letting them graze in open fields. From now on, I will supplement their feed with soybean meal and make sure they have water and salt,” said Ndzi. The renewed hope in better production has increased the interest in goat farming in the area as a source of income. Through the innovation systems in the north-west and other regions of Cameroon, the BecA-led project is collecting critical data on the genetic material available in the country that is feeding into a national goat breeding strategy.